This flight has an on-time performance of 84%. Statistically, when controlling for sample size, standard deviation, and mean, this flight is on-time more often than 95% of other flights. I didn’t realize one could control for standard deviation and mean. 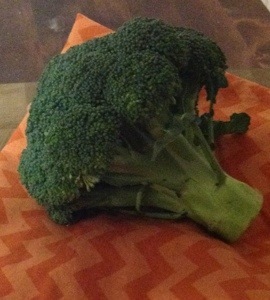 Did you know that broccoli is fractal in nature? 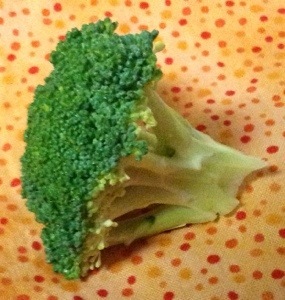 It’s self-similar – little bits of broccoli look like big bits of broccoli. I’m not the first to notice this: see Fractal Broccoli for the Gardening Geek and Fractal Broccoli with a Macro Lens, which features better photography. But what do you want before dinner? My art department has a variety of fabric backdrops, mostly from recent quilting pursuits. More about that, perhaps, in a future post. Atabey Kaygun experiements on the Collatz conjecture. Statwing on the ecological fallacy; also at Gelman and Hacker News. Warren O’Neill’s mathematical objects tumblr. Why it’s so rare for a wife to be taller than her husband. Bayes’ theorem using trimmed trees, by Brit Cruise at Khan Academy, via Oscar Bonilla.